Space per pupil: 1,100 sq.ft. 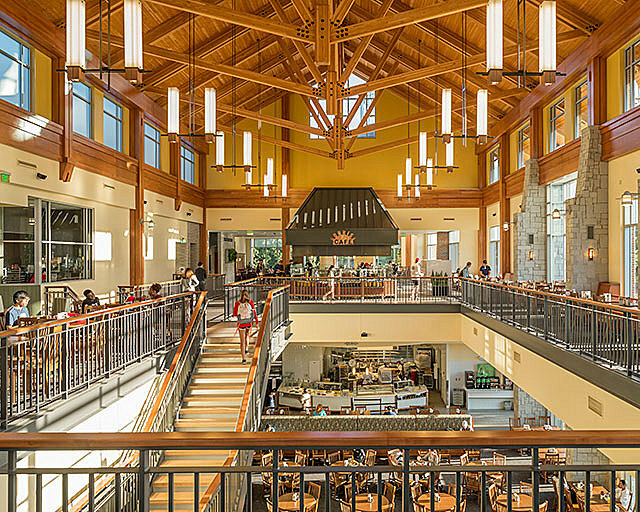 The new Bolton Dining Commons serves as an undergraduate campus hub, with 1,100 seats of dining plus a convertible, 200-seat private event space. Multi-platform, exhibition-style serveries on two floors emphasize fresh food cooking and small-batch production, promoting health and quality food practices. 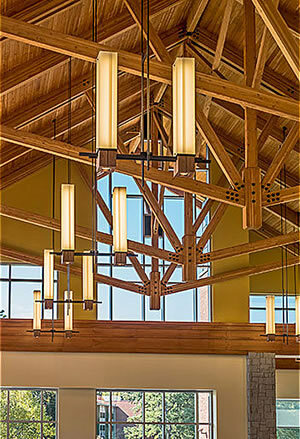 The building also houses 4,000 square feet of offices and administration space. 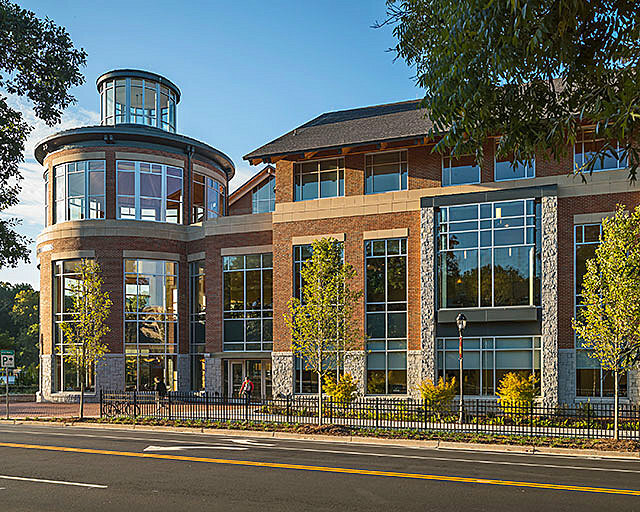 The form of the building is articulated with an exterior palette of brick, granite, cast stone, glass, and metal panels that complements the existing campus architecture. 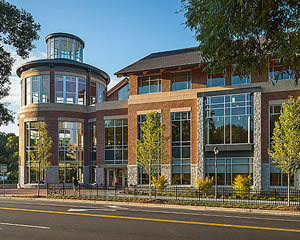 A 70-foot rotunda element provides a recognizable icon visible from Georgia Quad to the east, while an entrance facing Tanyard Creek allows easy access from the campus high-rise district to the west. 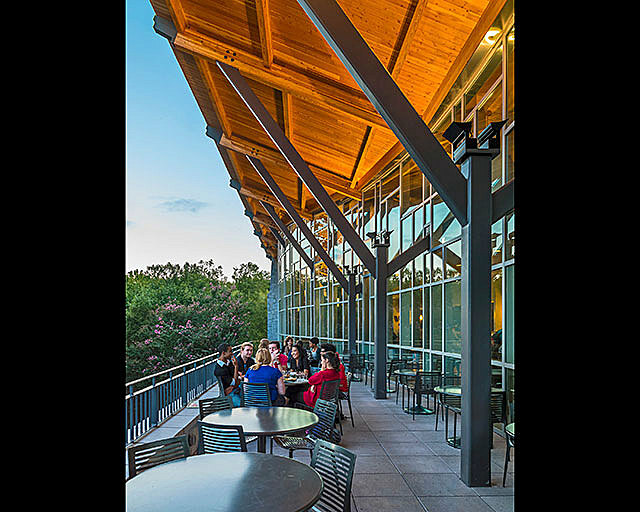 An upgraded pathway system along Tanyard Creek, including a new pedestrian bridge, enables enhanced campus connectivity as well as space for informal gathering. What is unique and different about this project? 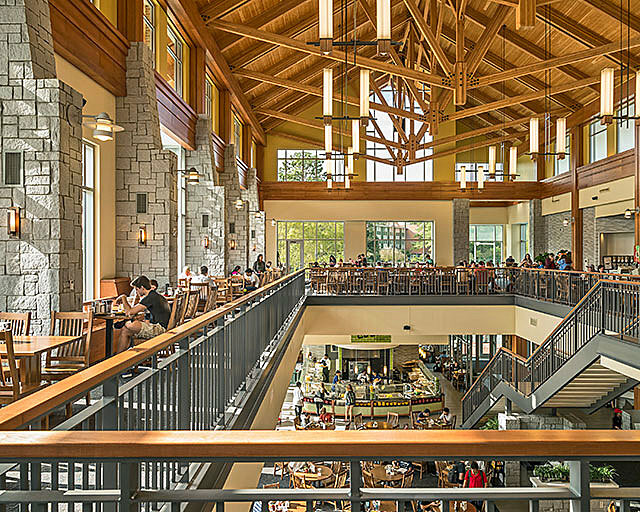 Student dining spaces should be sustainable, healthful and durable: Designers must take the lead in ensuring the healthiest buildings possible, in which students may dine, socialize and learn in an untroubled atmosphere. 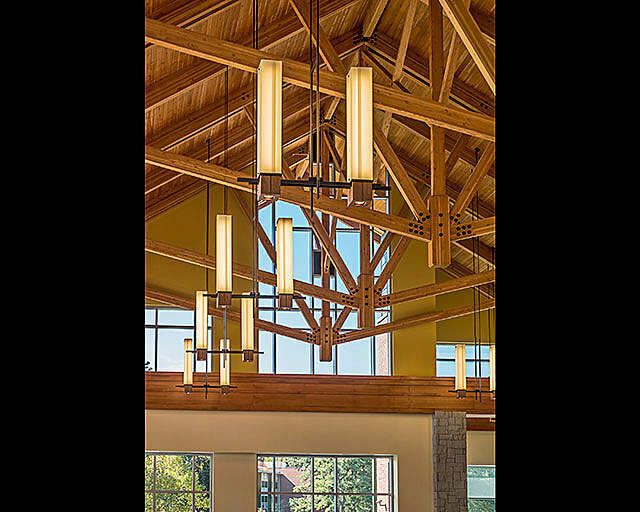 Employing sustainable designs is axiomatic with regard to buildings in which young people spend much of their lives. 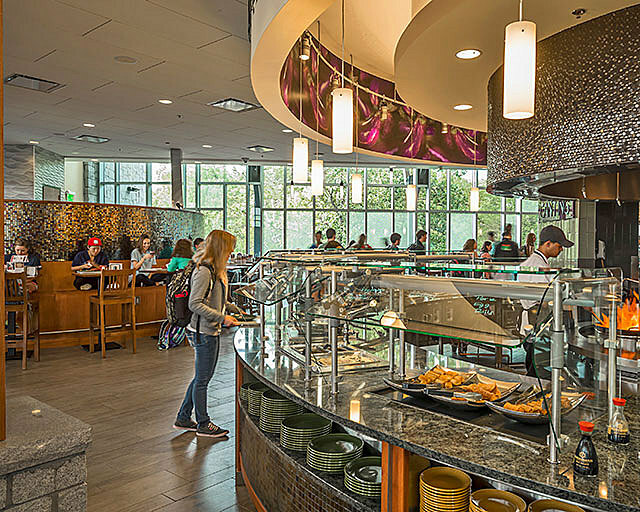 Student dining choices should also reflect freshness, health, sustainability, dietary and international diversity, and diverse venue options. The intersection of these principles builds health, well-being, diversity and community. 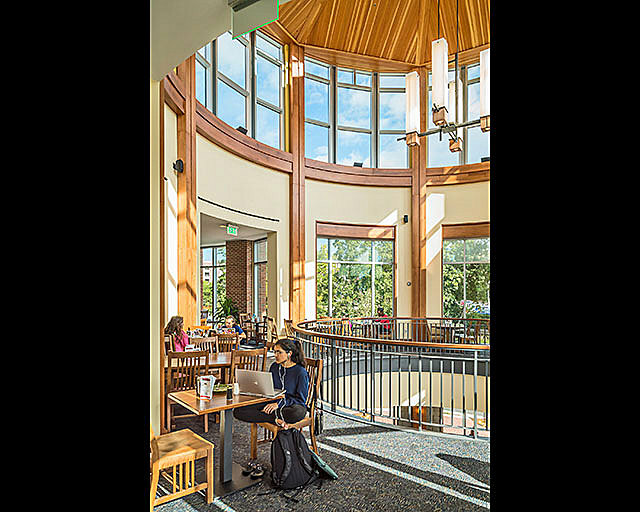 A community as an oasis: Dining commons should be warm, inviting spaces for students to congregate, collaborate and share experiences. 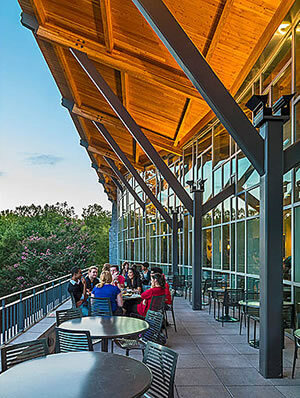 Such environments also build community, and attract top-tier students. Design should reflect the core values of the University of Georgia (UGA): UGA’s mission centers around excellence in many areas, and touch upon diversity, and on the “critical importance of a quality environment to an interdependent global society.” Sharing many of these values, the architects applied the positive elements of scale and streetscape already in play at UGA, adding dimensions of global sustainability. 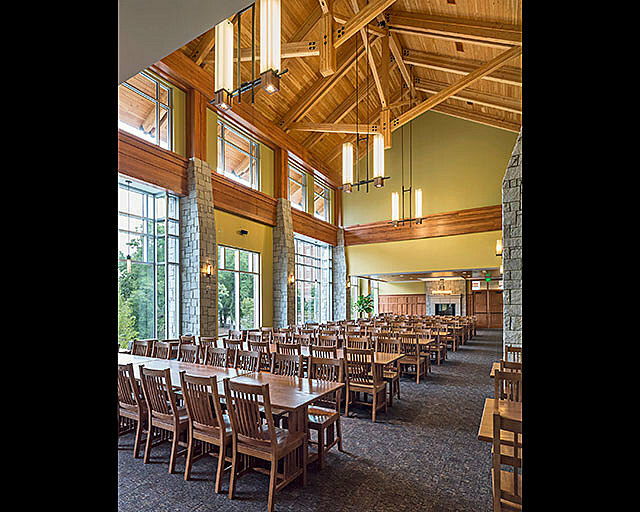 The design balances the historic and the contemporary, and encourages the exchange of ideas that is at the heart of all learning. What desired outcomes were your trying to achieve? 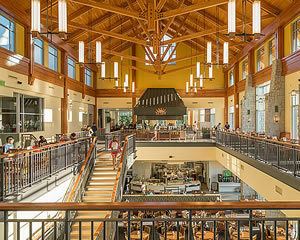 Bolton Commons opened in August 2014 as the largest food services venue on the University of Georgia campus. 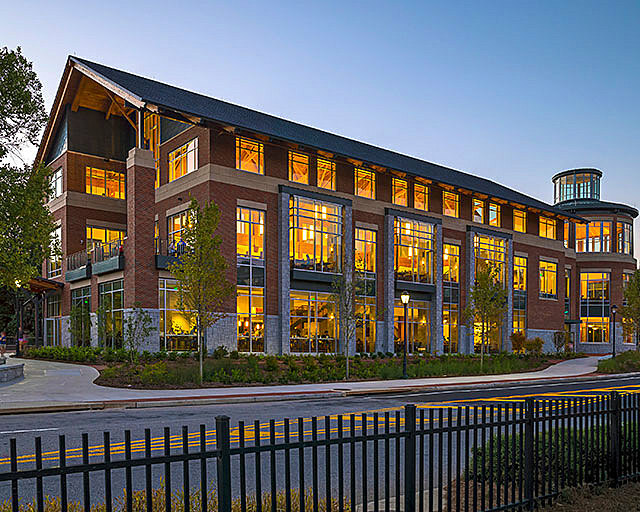 One of the design challenges was to create a building that physically complemented the grand neighboring campus buildings in scale while also being able to occupy its site and not feel overwhelming. 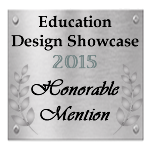 This has been achieved and was accomplished by an intentional use of a specific combination of materials. 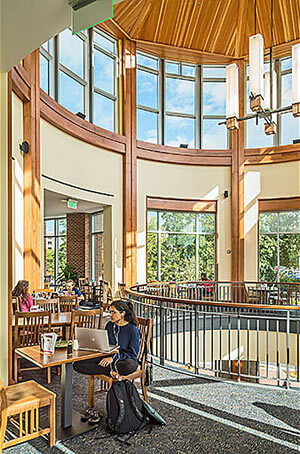 Creating campus connectivity was critical. 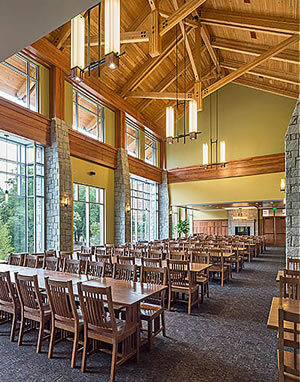 This busy campus area needed clarity of spaces equal in quality and design to other benchmark projects on the UGA campus. The pedestrian bridges on the outside of the building that link the Commons to the rest of campus are artistic architectural expressions that are also fundamental to campus walkability and superior pedestrian traffic flow. 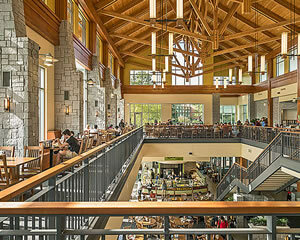 Supporting a nationally ranked campus food service operation was also critical. The realized building does just that and brings this amenity to a whole new level.